In 1851, Dr. John James Gravatt (1817-1886) erected his medical office on Lot 17 with a waiting room for patients and a consultation room for the physician. It was located on the corner of Market and Water Streets next to his home on Lot 24 (moved later to the current Town Hall lot). In 1938, the office was described as “an elegant Greek portico in miniature, which it is said, the builder copied from the front of Jefferson’s home, Monticello”. In 1970 the the office was cited as a “finely proportioned Roman Doric portico with Chinese lattice balustrade”. In January 2001, Mrs. Ned Stehl donated this historic doctor’s office building to Historic Port Royal, Inc.. The building was moved from original town lot #17 to its current location on the Town Green. Historic Port Royal has accomplished the restoration with a grant from the Virginia Department of Transportation, and support from the Town of Port Royal and Caroline County. Mr. Herbert Collins cut the ribbon on May 2, 2015, for the official opening of the new Port Royal Museum of Medicine. The former waiting room is now the “Port Royal Room” with artifacts that tell the history of the town while the former consultation room houses the tools of the trade used by doctors in former times. Listed below is a timeline of physicians that practiced in or around Port Royal. Please visit our museum to learn additional information. 1726: Dr. Paul Micou (1658-1730) was the first known physician in the Port Royal area. He patented 1,284 acres at Port Micou, south of the current town of Port Royal. 1727: Dr. John Symmer lived and practiced near Roy’s Warehouse before Caroline became a county until the founding of Port Royal. He was Dorothy Roy’s physician up to and including her last illness. After her death, Dr. Symmer had trouble collecting money due him from her heirs. 1738: Dr. Mugo Roy, who often rode his horse 20 or more miles to visit patients. He lived near the Essex County line and was married to Catherine Micou. 1740: Dr. Daniel Ferguson practiced at Roy’s Warehouse. He was also a tailor and used this to supplement his income. 1745: Dr. George Tod[d] (1711-?) began his practice in Port Royal around 1745. He also ran taverns in Port Royal and Villborro. He moved his office to Stage Road, Villborro in 1749. 1750: Dr. William Allison practiced in the vicinity of Port Royal from the middle of the 18th century until after the Revolution. 1750: Dr. William Johnston took over Dr. Todd’s practice in Port Royal. He practiced through the Revolution. surgeon’s mate on the Tartar and Tempest, two Continental privateers. After the war he practiced in Port Royal until 1812. 1777: Dr. John Tennant, II (1770-1816) practiced in Port Royal and later in Bowling Green. He was interested in research and extensively studied a means to control smallpox. His work did much to halt the ravages of the disease in Caroline County. His home, Tennant House on Lot 48 (at the corner of King and Market Streets), was used as a hospital to treat smallpox patients. 1788: Dr. James Tyler owned Lot 19 in 1802. 1796: Dr. George Washington Tennant was the son of Dr. John Tennant, II, and lived on Lot 48. 1814: Edmund Taylor (1785-1820) was not a trained physician but in 1814 he gave medical aid to Port Royal citizens and their servants. 1817: Dr. Malichi Foot practiced medicine in Port Royal. 1818: Dr. Patrick Carrick Robb (1791-1851) lived on Lot 7. He married Maria Pratt of Camden, and both are buried at Camden. 1818: Dr. Benjamin Sedwick was the first of Port Royal’s two practicing dentists. He lived on Lot 12. 1823: Dr. James M. (Doc) Turner was the town’s other known dentist. He lived on Lot 12. 1823: Dr. James S. Catlett (1788-1823) and his twin brother, Peter, were born on Lot 26. 1824 Dr. Stone announced he had settled in Port Royal and was open for business. 1830: Dr. Charles Urquhart (?-1866) purchased Lot 7 in 1830. Dr. Urquhart tended the wound of John Wilkes Booth in 1865. 1832: Dr. Benjamin F. Taliaferro announced he was residing at Hay’s Mount, north of Port Royal, and was open to the public. 1834: Dr. Phillip Lewis Lightfoot (1809-1884) was born on Lot 8, to Philip Lightfoot and Sally Bernard Lightfoot. He spent most of his life in Alabama. 1836: Dr. Gibson announced on May 25, 1836, he had taken up residence at Thomas Carter’s Hotel in town. 1851: Dr. John James Gravatt (1817-1886), was the son of Reuben and Lucy Timberlake Gravatt of Lot 24. In 1851, he built the physician’s office on Lot 17 – now the Port Royal Museum of Medicine on the Town Hall Green. Dr. Gravatt was educated at the College of William & Mary and the University of Pennsylvania. he married Mary Eliza Smith (1820-1920), and they had 5 children. In 1875, he became the first mayor Port Royal after the Civil War, and was a vestryman of St. Peter’s Episcopal Church for 31 years. He and his wife are buried at St. Peter’s, in Port Royal. 1851: Dr. Muscoe Boulware (1826-?) was the last of eight children born to Mark Boulware, III, and Lucy Dickenson Boulware. 1852: Dr. Edmund Pendleton White (1803-1856) lived in King George but had many patients in Port Royal. 1856: Dr. Robert Green Holloway, Jr.(1832-1919) was born near Mica. He never lived in Port Royal, but had many patients here. He married Eliza Spindle Amiss, and both are buried at St. Peters Episcopal Church in Port Royal. 1869: Dr. Hugh Morson (1809-1876) was married to Rosalie Lightfoot, daughter of Philip and Sallie Bernard Lightfoot of Lot 8. 1909: Dr. Charles Urquhart Gravatt (1848-1922) son of Dr. J. J. Gravatt of Lot 24 in Port Royal. Served as Fleet Surgeon under Admiral Sampson at the Battle of Santiago. Retired from the Navy to live on Lot 24 and work in the medical office on Lot 17. He attended schools in the town and graduated from the medical school in Baltimore. He was the medical examiner for the Department of the Navy. He married Florence Marshall of Erie, Pennsylvania, with whom he had one child, Charles Marshall Gravatt. 1903: Dr. Lloyd Noland attended medical school in Maryland and was a physician in Port Royal till 1904. 1904: Dr. Carter practiced medicine in town till 1905. 1912: Dr. Percy Schools was physician in Port Royal for 2 years. 1914: Dr. Joseph Minor Holloway (1889-1975) was the son of Dr. Robert Green Holloway, Jr. He graduated from the Medical College of Virginia and began his practice with his father in Port Royal. 1924: Dr. Rogers Newton Harris (1900-1985) was born at Naulaka in Caroline County. 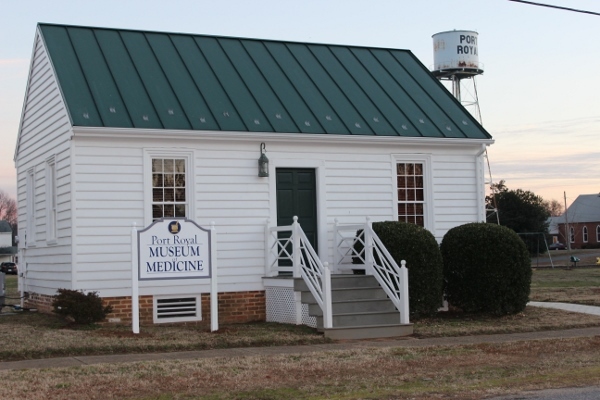 He took over Dr. Holloway’s practice in Port Royal when Dr. Holloway moved to Fredericksburg. During WWII he performed selective-service physicals and received a commendation from President Harry S. Truman. *Information from “Colonial Caroline”, by T. E. Campbell and “Hidden Village”, by Ralph Fall. We have both books for sale.